Discovering the Aztec Empire in the year 1519, Cortez found 200,000 people who lived on an island, in the center of a lake. Tenochtitlan which is now better known as Mexico City, must have been the biggest, most well fed city in the world of it’s time. This fortress city was special, completely surrounded by water. 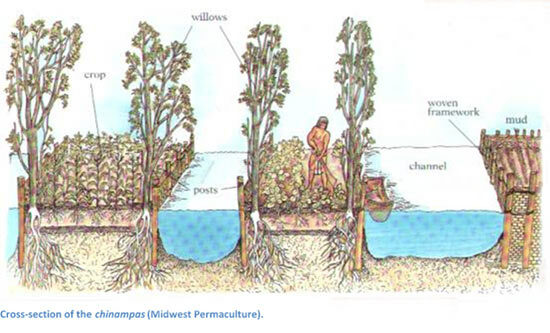 The Aztecs ingeniously built chinampas or “floating gardens” to feed their once enormous population. They converted the marshy wetlands of Lake Texcoco into arable farmland. What a masterpiece of engineering! Spreading over 300 feet long by 30 feet wide, workers weaved sticks together, forming giant rafts. They then collected mud from the lake and piled it on top of the raft at approx 3 feet deep. These were anchored to the lake, being attached to willow trees which were planted nearby. Each garden was surrounded by a canal which allowed canoes to pass through. This garden network stretched over 22,000 acres of the lake. Accompanied by companion plants, corn, beans, squash, tomatoes, peppers and flowers were planted, yielding seven crops in a year. The supply of water was vitally well managed to ensure a healthy harvest throughout the year. Flooding must have been a problem in the rainy season, hence the sophisticated draining system which was implemented. This included dams, sluice gates and canals. This further suggests a well organised agricultural project manned by the Aztec Empire. The same applied to the dry season. Water levels were maintained by carrying water to their crops from the canals. They fertilized their crops by collecting human excrement which was collected in canoes from the city. This cycle created a healthier living environment for the city as the wastewater would have also been treated. It is said that the City of Mexico once attempted to create a similar wastewater treatment system which was to function along the same lines as the Aztec chinampa system. The most fascinating aspect was the human agency with their ability to exploit the surrounding landscape to their advantage which indicates human ingenuity and sophistication. This may seem strange as they have always been viewed as a blood thirsty race. Furthermore, the evidence of a highly developed society was attained by the Aztecs. According to many historians, the Aztecs were interestingly a religious cult of sacrifice. Their gods were fearsome! Standing on top of the great pyramid, the victims would stare out over an expanse unlike any other with the sun at it’s peak, waiting for their heart to be cut out and sacrificed by fire. Thousands of heads must have rolled down the steps leading up to those pyramids, rivers turning reed in the noonday sun, begging the gods to keep the gardens thriving. As the sky went dark over Tenochtitlan, it was not the sun god who brought judgement, it was the Conquistadors. The Spaniard’s military bore an advantage over the Aztecs. Swords, guns and horses were nullified in the sanctuary of the floating gardens. Cortez was covetous of gold, not corn. He ordered the destruction of the chinampas. Torn to pieces by the hands that built them, the floating gardens of the Aztecs were thrown into the bottom of the lake, never to rise again.